We shared three new EXTERNAL storage innovations for the 2010 Mac Pro (and other models of Mac Pro) in our previous article. This time we want to highlight some internal storage innovations. They are great options for those of you who like to "think inside the box." Apple factory Mac Pro drive sleds come with screws so you can slap in up to four 3.5" SATA HDDs and plug them into the backplane. Apple will sell you SSDs as well. However, their SSDs are slower than third party SSDs and limited "budgeted" bandwidth makes using more than three SSDs internally superfluous. The backplane can also handle SAS drives though you will need to mate them to the Apple Pro RAID Card. The latest version of that card has no cabling. (It is compatible with 2009 and 2010 Mac Pros.) Just plug it into the #4 PCIe slot and it takes over the four internal drive bays. It's magic. What's not magical is the max speed rating of the $699 RAID card: 550MB/s. That leads me to the third party innovations. 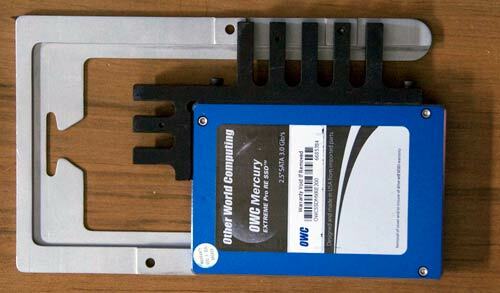 You have read my comments before about the Mercury Extreme SSD from Other World Computing. It's based on the SandForce chipset with overprovisioning, error correction, and load leveling. They make excellent boot drives and scratch volumes. They cost less than and are faster than the Apple SSD offerings. Stripe them to get even more speed. Two of them in a RAID 0 set will will do 500+MB/s which exceeds the 475MB/s requirement for HD 1080 60p 10-bit capture. But how do you mount a 2.5 inch SSD on a Mac Pro factory sled designed for a 3.5 inch HDD? 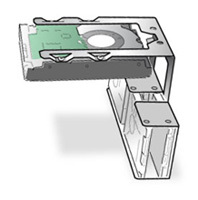 OWC's solution is the Icy Dock which easily converts any 2.5" drive into the 3.5 inch form factor and has screw holes in the same location as a 3.5 inch drive so you can mount them to the Mac Pro factory sleds (or mount them in an external 3.5" enclosure). 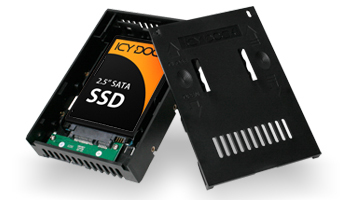 There's even a new model of Icy Dock that takes both SATA and SAS 2.5" drives. I expect you can order through OWC as well even though it's not currently listed on their site. MaxUpgrades created a MaxConnect custom sled to mount the original Velociraptor removed from its "ice pak" since the ports didn't line up correctly. It's evolved into a great way to mount an SSD complete with aluminum heatsink. As you can see from the photo below, the SSD has to be offset so that the ports line up with those on the main logic board of the Mac Pro. 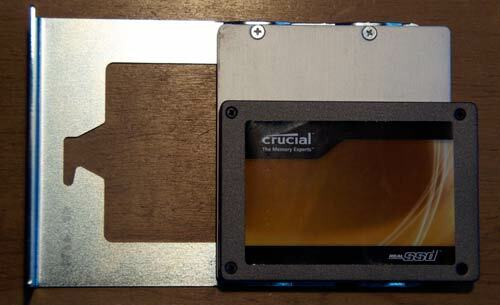 Trans International has their own version called the "Pro Sled 2.5" that fits any 2.5" drive (SSD or HDD). 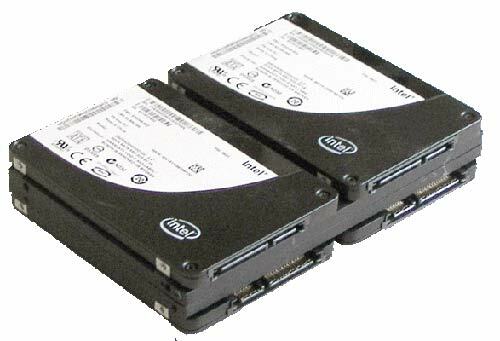 They also have regular sleds for 3.5" drives in case you need spares. In addition, Trans International has a custom sled called the DX4 which mounts a drive in the normal location but also adds up to four 2.5 inch HDDs or SSDs at a right angle so they hang into the unused space between PCIe cards and the side cover. Clever. It does require a SATA host adapter with internal ports to run those drives. Trans International offers a bundle with the RocketRAID 2310 host adapter, power cables, and data cables. Another way to add storage inside your Mac Pro is to use the second optical bay. Trans International has a kit called the ProCaddy 2 that adds two HDDs or two SSDs below the SuperDrive by replacing the factory optical bay housing. 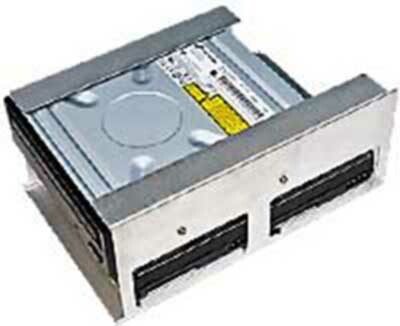 MaxUpgrades has their MaxConnect optical bay assembly that mounts four 2.5" SSDs or HDDs. 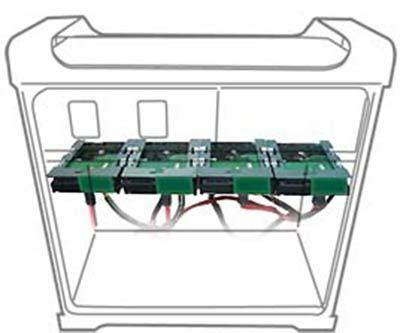 If you just put one drive in the spare optical bay, you can use the combination power/data connector that the factory provides. If you install more than one, you need a host adapter and a power source. If you have a 2008 or older Mac Pro, there are two spare SATA ports on the main logic board that can be used for drives in the optical bay. The 2009 and 2010 Mac Pro no longer have an internal mini-SAS connector that can be used with third party SAS controllers with internal mini-SAS ports. Apple's latest Pro RAID card uses a proprietary pin out in the 4th PCIe slot to communicate with internal drives -- and they have yet to share their secret with third party host adapter makers. But MaxUpgrades found a way around this. They designed a MaxConnect BackPlane Attachment. They draw power from the backplane but point the data port downward at a right angle so you can connect to a third party SATA or SAS host adapter with internal ports. Trans International "skins the cat" another way. They have a special sled and cable kit that faces the drive ports outward, thereby bypassing the backplane all together. It's called Pro Cable. Apple does provide ways to expand internal storage but there are limitations that can be frustrating. I am thankful that there are companies that turn frustration into creation.